Ericka Mitchell is the Director of Biotechnology at McKinley Technology High School in Washington, DC and a National Institutes of Health Innovation in Education Fellow. She is a long-standing proponent of science education reform and continually seeks novel inroads for the effective engagement of students in authentic and personally relevant science projects. My participation in the BLM Project was one of the most significant professional growth opportunities I have ever experienced as an educator. The program challenged me to bring next generation science to the future generation of scientists in a manner that is comprehensive and accessible to everyone. At times I felt stretched beyond my limits, BUT these times were certainly offset by the innumerable instances when we all enjoyed the satisfaction that comes along with confronting a difficult topic and then placing it within the reach and comprehension of a broad diversity of students. It is difficult to describe how it feels when you realize that they truly GET IT! One aspect that I enjoyed most was that my students and I were placed in a position where we were all functioning as scientific colleagues and peers, working toward a common goal in a way unlike any other project we had undertaken in the past. Our sense of accomplishment was not derived from bands on a gel or DNA sequences to be edited ... it came rather from the triumphs and trials associated with the authenticity of the project, which was not always clear cut, perfect, or pretty, like so many of the more traditional, cookbook lab experiences dominating secondary science instruction. It seems to me that student excitement and investment comes from being empowered, from having the unique opportunity to fail, to persevere and to overcome the same challenges that bench scientists experience everyday. And as if that was not enough, our work actually contributed to a larger body of research, helping to advance our understanding of biodiversity, and this is what made this an unforgettable experience for my students and for me. 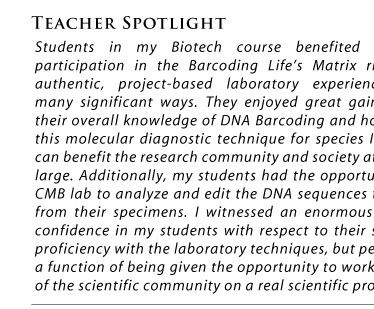 This project has reignited my passion for teaching biotechnology! I will always be grateful. 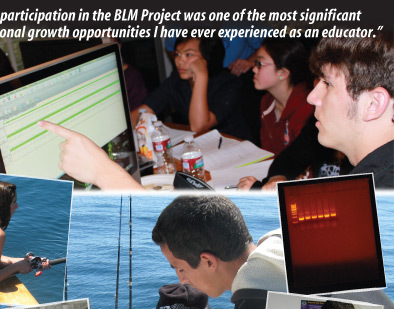 The BLM program is unique and I am honored to have been able to experience a project that carries with it an ethos, philosophy, and structure that will certainly serve as a blueprint for the future of science instruction in our nation!